Hot Jupiters are the earliest discovered and the most studied class of exoplanets. They have a comparable size to that of Jupiter and orbit very close to their stars (typically <0.1 AU). Many studies have been attributed to understanding the dynamics and the composition of their atmospheres, with some mysteryies still unsolved, such as the inflated size (e.g. bite1, bite2). The authors of today’s paper announced the exciting news of finding titanium oxide (TiO) in the atmosphere of a hot Jupiter, WASP-19b. WASP-19b is so close to its star (~0.016 AU) that its effective temperature is more than 2000 K. At this high temperature, the refractory metal, if any, should be present in the gas phase and potentially form metal oxides. Astrophysicists have proposed that there should be titanium oxide (TiO) and vanadium oxide (VO) in some of these hot objects. 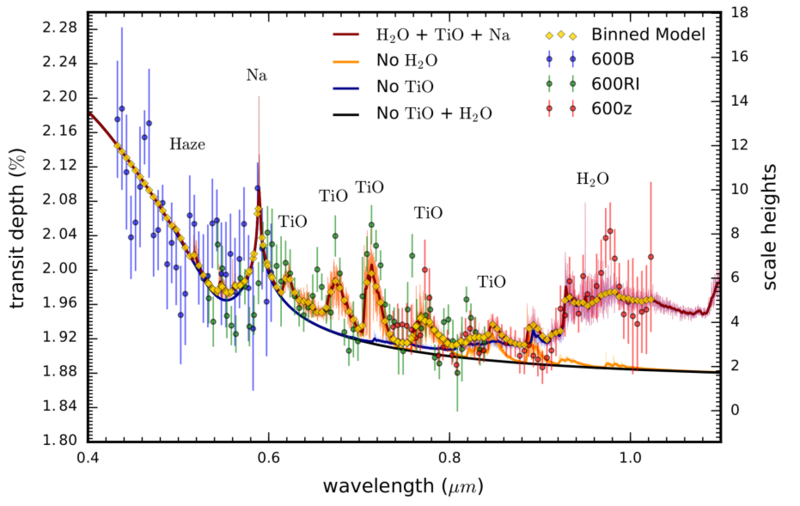 One of the reasons to look for TiO and VO is that we have seen them commonly in brown dwarfs. Arguably, gas giants and brown dwarfs share some similar characteristics and formation mechanisms. So astronomers have been extensively searching for any sign of TiO and VO for a decade. However, no definitive detection has been made until this work. Figure 1 shows the light curves from three transits of WASP-19b observed by the Very Large Telescope (VLT). The relatively high-resolution data allows astronomers to obtain essential planetary parameters (e.g. planetary radius). With the knowledge of the planetary radius, one can construct models to fit the wavelength-dependent radius (transmission spectrum), which reveals the absorption features from distinct species as shown in Figure 2. The authors found the best-fitted model is the one including H2O, TiO, Na, and haze particles producing the slope of Rayleigh scattering at the shorter wavelength. The detected abundances are in general smaller than solar composition. Light curves of WASP-19b from three transit observation campaigns. The color of each row corresponds to different wavelength ranges (600B (blue), 600RI (green) and 600z (red)). 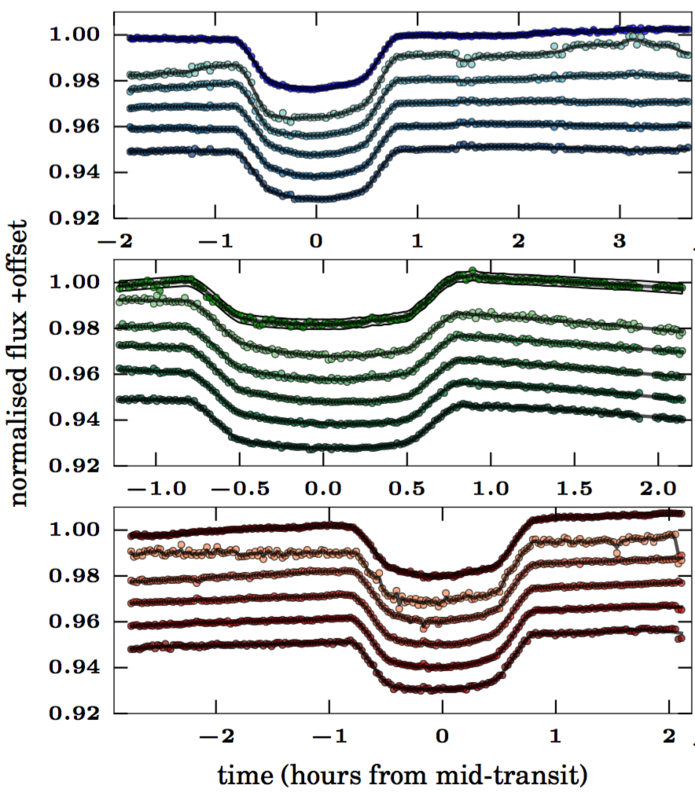 For each set, the top plot is the broadband transit light curve, used for determining planetary parameters. The others are spectral light curves produced with bins of 50 nm. WASP-19b transmission spectrum. Blue, green and red data points correspond to observations with different band-ranges (600B, 600RI and 600z). The best-fitting model (red) includes H2O, TiO, Na, and a global haze. Other curves (orange, blue and black) represent models with specific species removed. TiO and VO that exist in the gas phase at extremely high temperature (higher than about 2000 K) are exceptionally absorbent to visible and near-infrared radiation. They act similarly to the ozone layer that absorbs UV on Earth, causing the temperature inversion in the stratosphere, where temperature increases with altitude. The structure with warmer airs sitting at the bottom is very stable since convection is prohibited. This is another reason that motivates the search of TiO and VO. Astrophysicists initially proposed there is likely a type of hot Jupiters exhibiting temperature inversions, but none compelling evidence has been found yet either. Naturally, the authors suggest future observations of thermal emission with the Hubble Space Telescope or James Webb Space Telescope to look for the evidence of the temperature inversion. In addition, based on the current observed hot Jupiters, why statistically the presence of TiO/VO or the temperature inversion appears so rare is another captivating question to keep astronomers busy. 1) The TiO abundance we found is actually inconsistent with solar abundances at >5 sigma confidence. 2) It is titanium dioxide (TiO2) that is commonly used in sunscreen, not titanium monoxide. Article edited. Thanks for the corrections! The titanium oxide used in sunscreens, paint and other products is titanium dioxide, TiO2, not titanium monoxide, TiO.